As a point of lurid interest, refusing to buy anything may be anti-materialist but it is not anti-capitalist even if that’s your intention. When you stop buying things but continue to earn money through work, your earnings continue to serve the capitalist machine. The bank in which you store your wealth “spends” your savings when they invest it. (That’s why the bank pays you interest: as a reward for letting them play with your money.) Perversely, saving and spending actually amount to the same thing so far as the economy is concerned. But when you reduce your income as well as your spending, it actually does hurt the capitalist machine! If your motivation to engage in minimalism is to smash the system, you must remember to reduce your income as well as your spending. Thus, only Escapological minimalism, since it aims to reduce work as well as consumption, will genuinely throw a spanner in the works of capitalism. Play outdoors. Love the earth. Live simply. Use only what you need. That’s the creed of Daniel Norris, rookie pitcher for the Toronto Blue Jays of Major League Baseball. 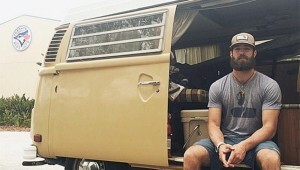 Despite earning a seven-figure salary, he chooses to live in a VW Westfalia, and gets by on $800 per month. Here’s hoping he can stick to his principles, stay free, and keep the van running. ★ Buy the lastest issue of New Escapologist at the shop or pre-order Mr. Wringham’s forthcoming book. I’m still editing the book, which is why the blog’s been a bit quiet of late. Habits are cumulative. Write a thousand words per day and you’ll have an 80,000-word book in the time it took Phileas Fogg to circle the Earth. Eat a pound of lard every morning and be medically corpulent in the same time. ★ Buy the lastest issue of New Escapologist at the shop or pre-order the book. Few would argue that trying to have a career (and get paid) is an easy ride. And yet choosing not to have a career seems to be the new social taboo. Reader JR Lewis directs our attention to an interesting article, written from the perspective of a 29-year-old woman, about the realisation that “having it all” might not be worth having, especially when it’s such a bloody struggle. Life doesn’t suddenly stop when you decide to leave a job, or change tack and do something completely different for a bit. You don’t become a different, lesser person overnight. Admitting that the coveted position you’ve spent years of student debt, overdraft fees, and shittily-paid junior roles grafting your way toward doesn’t make you happy isn’t giving up. If you have learned skills, you can go back to them.